With most companies using some form of virtualized system in their infrastructure, security is becoming an increasing concern. While the benefits of using a virtualized solution are enormous, so are the risks. Understanding what your options are with virtualization security is essential. With Kaspersky Security for Virtualization in place, you can realize the enormous benefits of cost containment and the efficiency of centralized management without the drain on resources and infrastructure. 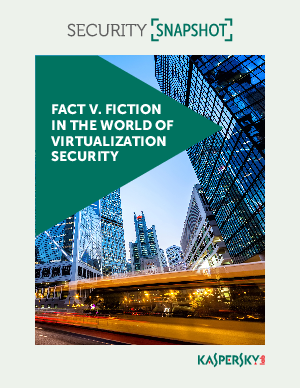 Download Kaspersky Lab’s Snapshot1, Fact v. Fiction in the World of Virtualization Security, to learn how you can maximize the performance and security of your virtualized machines. 1.Kaspersky Lab’s Security Snapshot series gives brief overviews of security issues that most affect our customers, giving you the key information you need in a concise format.